Belmont celebrated the new Frederick Hart Studio Museum on Thursday morning with an opening ceremony at the Lila D. Bunch Library. The new museum, which recreates the renowned sculptor’s studio, opened to a large crowd which included the sculptor’s wife Lindy Hart, his two songs Lain and Alexander Hart and President of the Frederick Hart Foundation Bob Chase. The museum offers a look into the sculptor’s creative space, with sculptures, molds, plasters and personal items such as cassette tapes and books . Additionally, the renovated library lobby now features a full-size bronze version of Hart’s Christ Rising. University president Dr. Bob Fisher believes Hart’s displayed work will serve Belmont students. 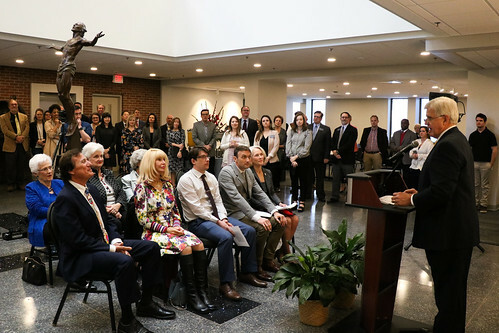 “To have so much of his work available for viewing on this campus is an invaluable gift, one that I believe will prove inspiration for our students and the broader community for generations to come,” Fisher said. The museum will be open from 9 a.m. to 5 p.m. on Mondays through Saturdays and 1 to 5 p.m. on Sundays. It will be free to all Belmont students, faculty and staff.